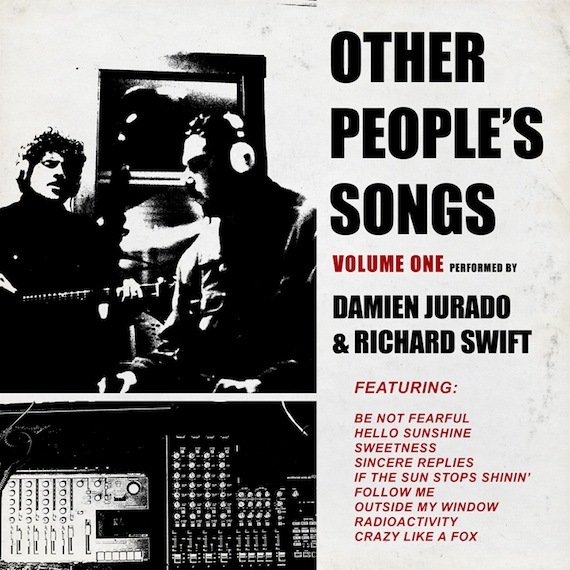 Last week via Tumblr Damien Jurado and Richard Swift dropped Other People’s Songs Vol. 1, a free, 9 track, digital download featuring the pair covering some of their favorite songs. The tracks range from Bill Fay and John Denver to Kraftwerk and Yes. “Other People’s Songs Vol. 1 is a collection of covers recorded on the weekend of August 21-22, 2010 (with the aid of a four-track cassette recorder and a Coles-4038 ribbon microphone).” AD caught up with Swift and asked him to run down the tracklist with his thoughts on each selection—read below and download the collection HERE. Outside My Window (Originally by The Fleetwoods) :: This is a song we listened to quite a bit when recording “Saint Barlett” and also when making the “Arkansas” video. It’s a quite song, and there’s a lot of tape hiss on the recording… you don’t hear that very often these days, so I find it charming in a way. This might be my personal favorite on the record. I would love to hear an original versions comp of this, the way you guys did the Yo La Tango. Thanks for this, AD! Always fun to get the inside scoop. This is great!! Love what R. Swift has been doing lately with his website. Giving the masses unreleased B sides and what not. if the sun stopped shining has been a favorite song of mine for years. the cover is ok but those backing vocals really bring it down and seem to make a joke of the song. swift’s comments also seem to display a lack of understanding of how devastating the original is. @ Mandrew – Funny, because your comments seem to display a lack of understanding of how overly serious you are. Jesus, it’s not like you paid to hear it. fair enough. i’ll accept the designation of being overly serious about my favorite works of art. and i don’t think the cost of art has to do with how one judges its value. I’d imagine no matter who the artist, if they sit at the top of your list, it will be difficult to find a cover that will satisfy your expectations. This is why it’s almost impossible to cover a Beatles song without making someone feel uncomfortable. I do think, however, that the cost of art should come into play when making a judgement on it’s quality. Swift and Jurado made no bones about this collection of songs being little more than a spontaneous, fun-times present for their fans, especially since neither of them tend to stick covers on their “proper” releases. That being said, as goofy as the bgv’s might sound to you, I think their version still conveys some of that heart-breaking feel of the original. Mind you, this is coming from someone who heard the cover first (for shame!). I need to download the album not just stream it – any idea how that works? Unfortunately you have to do it one track at a time, but it was worth it to me. damien told the story of playing radioactivity on the manchester show of a Uk tour a few years ago, hearing this cover brings the experience full circle, great LP.